Famous for its fortress-town of La Cité restored by Viollet-le-Duc, Carcassonne is a must-see when you're in this part of France. 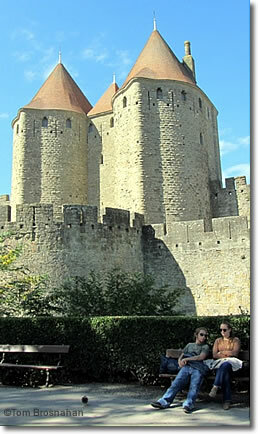 Carcassonne is famous for its marvelous fortified city on a hill commanding the modern city. You can do a quick visit in half a day, but a full day is necessary to truly enjoy all it has to offer: wandering its narrow streets, inspecting its churches and public buildings, touring the Château Comtal citadel within the fortress, circumambulating the ramparts, and stopping for a drink, a snack or a meal in one of its cafés or restaurants. 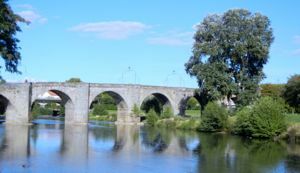 —Modern Carcassonne, the rest of the city outside La Cité and La Bastide, not usually the goal of a visit, but useful for lodging and other services. Street signs can be confusing, as Centre-Ville is not the same as La Cité, but when you get to Centre-Ville, more or less at La Bastide, you'll easily see La Cité on its hill. Above, Sitting in the shade outside the main gates of La Cité, Carcassonne, France. Below, The Pont Vieux, connecting La Cité and La Bastide.